1 pc. I 1/2"x9 1/4"x 9 1/4" S 2 S Top. 4 pcs. 1 1/4"xl 1/4"xl2" S 2 S Legs. The milking stool is usually such a rude, unsightly piece of equipment that it gets but little consideration and is often found dirty and poorly cared for. In the modern dairy many of the old-fashioned, dirty and unsightly pieces of equipment are giving way to things which are more convenient and more satisfactory from a sanitary standpoint. This lesson shows how to make a milking stool on the same principles which any other stool should be made. The fact that it has four legs keeps it from falling over and getting unnecessarily soiled, also provides it with greatest strength. The height of the stool can be made to suit the desire of the one who is to use it. This plan of making a stool is universal and can be used in making a bathroom, kitchen or office stool. Of course in making a high stool it would be necessary to provide cross rails to brace the legs. U. S. Bulletin No. 689, A Plan for a Small Dairy House. U. S. Bulletin No. 413, Care of Milk on the Farm. U. S. Bulletin No. 602, Clean Milk. U. S. Bulletin No. 363, The Use of Milk as a Food. U. S. Bulletin No. 32, Silos and Silage. Minnesota Bulletin No. 130, Feeding Dairy Cows. Forest Planting and Farm Management, U. S. Bulletin No. 228. 4 - Voc. Note: - This project can be made to serve either as a milking stool or a bathroom stool. If it is to be a bathroom stool it should have very careful workmanship, and should be painted white or enameled. Select the best surface of the piece which is intended for the top and prepare a working face (Chapter II., Paragraph 2). If you are to use the design of top shown in the drawing, you will find it convenient first to make the material perfectly square, and then follow the directions for laying out an octagon given in Chapter 1, Problem 14. Saw out the octagon and plane all the edges perfectly square. The top edge may be rounded or chamfered (Chapter II., Paragraph 19). The holes which are to receive the legs are to be bored with a 7/8" or 1" bit, whichever you may have in the shop. Determine the angle which you wish to use (this can be done with the eye). Then set the T-bevel. Hold the T-bevel in such a position as to keep the bit at the proper angle while boring the holes (Chapter II., Paragraph 12). 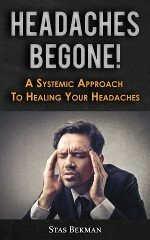 Do not bore the holes entirely through. In making a milking stool the holes are sometimes bored entirely through so the legs can be wedged in from the top side and sawed off even with the top. In making the legs, first plane the material perfectly square (Chapter II., Paragraphs 2, 3 and 4). They are to be made octagon shape by planing away the corners. These corners should be gauged with the lead pencil and finger (Chapter II., Paragraph 8). Carefully plane to the gauge line. The top end of each leg is to be rounded so it will enter the hole in top board. This may be done with a knife and finished with a wood file and sandpaper (Chapter II., Paragraph 15). Spread a little glue on the rounded ends of the legs and drive them into their places. When the work is all assembled, thoroughly clean it with a steel scraper and sandpaper. The bottom ends of the legs may be laid out the desired shape by setting the stool on a table top or level floor and laying out with the compasses; or this may be done by laying a ruler flat on the floor, and marking on the top edge of it all around the legs; saw on these lines. If it is to be used for a milking stool it should be given a coat of paint of any desirable color (Chapter IV., Paragraph 52). If it is to be used for a bathroom stool it can be made very attractive by giving it two coats of white paint, and one coat of white enamel. 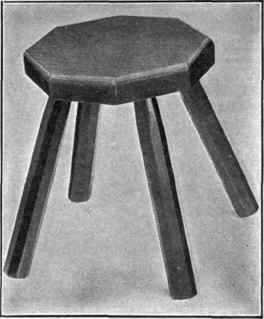 It is sometimes thought desirable to make a milking stool with only three legs so that it will sit level on an uneven surface. If you care to do this, follow No. 1 in the suggestions given. 1. It is usually desirable to have the school kitchen equipped with stools. These can be made on the same plan used in the construction of the milking stool. The top should be round, of the desired size, possibly 10" or 12" in diameter; the legs may be round, octagonal or square. They should be about 18" long. 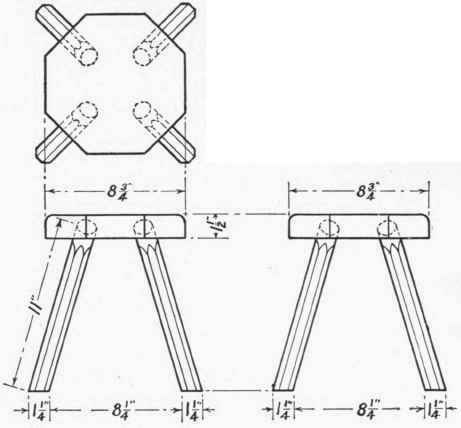 There should be two cross rails between each pair of legs, as shown in suggestion No. 3. White enamel makes a very desirable finish for a stool of this kind. 2. An office stool may be made on the plan already given with the height changed to suit individual needs. The solid top may be used, although a more desirable plan is to construct a frame of four pieces neatly joined with dowels, as shown in suggestion No. 3. This frame may have a bottom woven of cane or may be covered with a patent imitation of leather, which can be purchased at any furniture store.